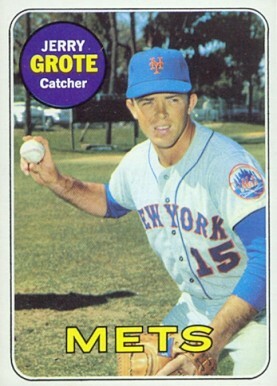 Jerry Grote is best remembered as an excellent defensive catcher during his career and as the catcher for the 1969 Miracle Mets. He caught every post-season game that fall for the Mets and during that 1969 season hit .252 which would also turn out to be his lifetime batting average. How good a catcher was Grote? The immortal Johnny Bench once said “If Grote and I were on the same team I’d be playing third base.” The great base stealer Lou Brock said that Grote was one of the catchers he had the most difficult time stealing a base on. Grote was not only had an outstanding throwing arm but was known for his handling of pitchers. In the late 1960’s the Mets were developing a fine young pitching staff which included Tom Seaver, Jerry Kooseman and Nolan Ryan- and Grote rightfully received a lot of credit in helping to bring them along. He was also recognized as being a highly competitive player. A Texan, Grote went to Trinity University and then signed with the new Houston Colt 45’s. He was in the majors at the age of 20 in 1963 for a few games before making the team in 1964 and platooning behind home plate with John Bateman. he Astros back in the 60’s and 70’s made some awful trades and one of them was in October 1965 when they traded Grote to the Mets for a pitcher who never appeared again in a major league game. Grote was 5’10” 185- hit and threw right handed. He played with the Colt 45’s/ Astros from 1963-64. Mets 1966-77, Los Angeles Dodgers as a back up in 1977 and 1978, came out of retirement in 1981 and played for Kansas City and the Dodgers again before retiring for good. He played in 16 seasons. His career totals with a bat in his hands- he hit enough- but again was in the major leagues for his defensive skills. 39 home runs, 404 RBI a career .252 batting average, .316 on base percentage, he ran like most catchers-15 stolen bases. His career WAR is 15.1- most of that WAR coming from his defensive stats. He was a two time All-Star- 1968 and 1974. His best seasons hitting were probably 1968 and 1969. In 1968 he hit 3 home runs 31 RBI and a .282 average. In 1969 he had career high’s in home runs- 6 and RBI 40 while hitting .252. Also in 1969 The Miracle Mets year- Grote behind the plate threw out 56.3 percent of the runners who attempted to steal on him. Grote is in four Hall of Fames- the Texas Baseball Hall of Fame, San Antonio Hall of Fame, New York Mets Hall of Fame, and the Trinity University Athletic Hall of Fame. Grote was one of the first people mentioned by Nolan Ryan in his Hall of Fame acceptance speech. In The New Bill James Historical Baseball Abstract- Grote is listed as the 66th greatest catcher of all time. The book was published in 2001 so if a new list came out no doubt he’d fall a bit but a pretty good ranking for someone who was a great defensive player but no great shakes as a hitter. Grote still lives in his native Texas and is now 75 years old.